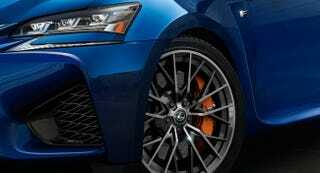 Lexus recently debuted the (somewhat leaden) RC-F, a hybrid of IS- and GS-components fashioned into some kind of BMW M3 fighter. Now Lexus is getting ready to show off its M5 rival. This is the GS-F. Lexus isn't saying what this car is, but we happen to know a spy photographer who cleared things up for us. That Lexus would make a GS-F isn't exactly surprising, given their steady march towards 'emotional' designs (blech), and that the RC-F shares a lot with the GS already. The car is set to make its official debut at Detroit in early January, where we will all get to hear another round of tired Predator face and Nike swoosh cliches.